So Glastonbury has been and gone, and it’s been the first year that I’ve watched most of the acts (on TV, not live…I wish) and I feel sorry for acts having to perform in the pouring rain as opposed to this week the UK has a heat wave. I also learnt this week that Glastonbury started as a small show in a farmers field and has escalated to such a large part of English Summer Festivals. Today, I’ve gathered my favourite of the celebrities looks from the week. 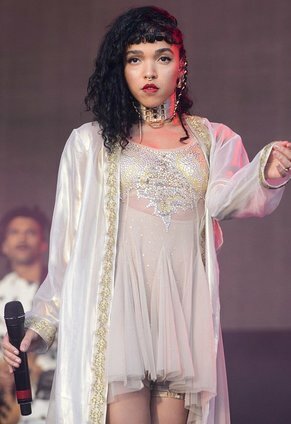 FKA Twigs looks good as always, performing in a sheer embroidered dress. Ella Eyre in an Adidas jacket, grey dress and hunter wellies, I am literally in love with this girl. Laura Whitmore looked amazing in a suede dress, her outfit suited her so well. Caroline Flack nailed it in fringing, wellies and suede. Florence Welch wore a festival friendly embroidered poncho, the detailing on it was beautiful. So here are my favorites from Glastonbury, which are yours? I love looking at celebrities impressions of festival fashion mixed with their own personal style.